Looking for the best gaming mouse for World of Warcraft? Well the mouse I’d like to review today is very MMO friendly and budget friendly making this mouse a must have, especially for WoW players. This mouse can go up to 16400 DPI, has about 18 programmable buttons, has weights inside of the mouse to optimize your comfort with it and it’s available for under $40. This mouse is a steal for the amount of value that it brings and you won’t regret choosing this MMO mouse over the many others that are higher priced. I understand that when playing World of Warcraft it’s great to have as many buttons assigned to as many skills/attacks as possible and this mouse is going to do exactly that. You’ll also be ensured high precision because of its max dots per inch settings. This mouse was built for gamers. The Redragon Perdition has multiple DPI settings so that you can get the best feel while you are gaming. The different DPI settings are 1000 DPI, 2000 DPI, 4000 DPI, 8200 DPI and 16400 DPI. Not only are you able to adjust your dots per inch settings but you can also use the 8-piece weight tuning set (2.4g x8) that you can adjust and put inside of the mouse to help you with being able to maneuver it the way that you see fit. With these features and a 1000 Hz pulling rate you can be ensured that you’re getting a high quality MMO mouse if you were to use this mouse. There are small weights inside that you can add/remove to whichever weight you are most comfortable with. There is a total of 18 programmable buttons that you can set to whatever you feel like setting to. The drivers included with the mouse allow you to program the mosue buttons to anything you want. There are also 5 memory profiles that you can switch in and out of and you can tell which profile you are using because the mouse has different LED options for when a certain profile is being used. This is an awesome feature because not only are you able to switch profiles right away but you’ll also be able to tell which profiles you are using based on the different lights that it uses. There are over 16 million LED color options with this mouse and if you’d like the LED may be disabled. 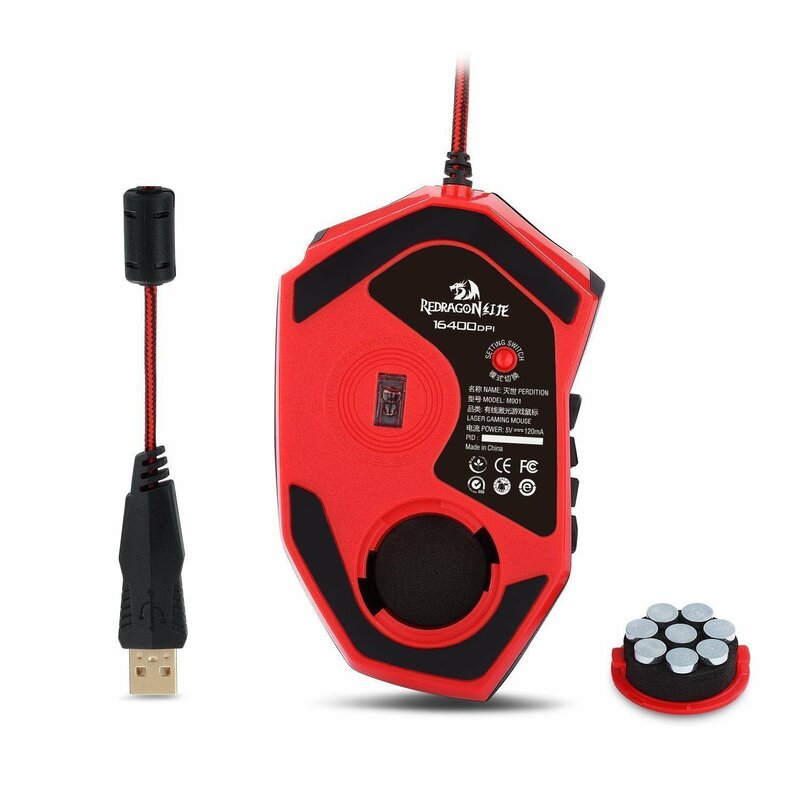 This USB wired gaming mouse comes in two color choices of red/black and red/white. If you wanted to purchase this mouse then I’d suggest sending a message to the seller and let them know which color you’d like to go with. I think they ship out the red/black color scheme by default but it’s always good to make sure. When comparing this mouse to other MMO gaming mice such as the Razer Naga or the UtechSmart Venus you’ll notice that the only differences would be the max DPI, the prices and the look. The Razer Naga being almost $30 more expensive doesn’t have other color options, it’s max DPI is set to 8400 DPI and it doesn’t have as many programmable buttons as the Redragon Perdition. This doesn’t make sense and so in my opinion the Razer Naga would be a total waste of money. Though when comparing this mouse to the UtechSmart Venus then you’ll see that the only real difference would be the price. Although there is only a couple dollars of a difference you’re still essentially getting the same mouse just a different look and design. If you’re looking for the best MMO mouse on the lowest budget possible then the Redragon Perdition is definitely the right choice for you. What I like best about this mouse is the ease of setting up any macro to any button that you’d like. For other gaming mice this can be an annoying issue because the companies don’t make the process easy to understand. When you order this mouse your package comes with the mouse, a user guide and a CD with the software/drivers needed for this mouse. 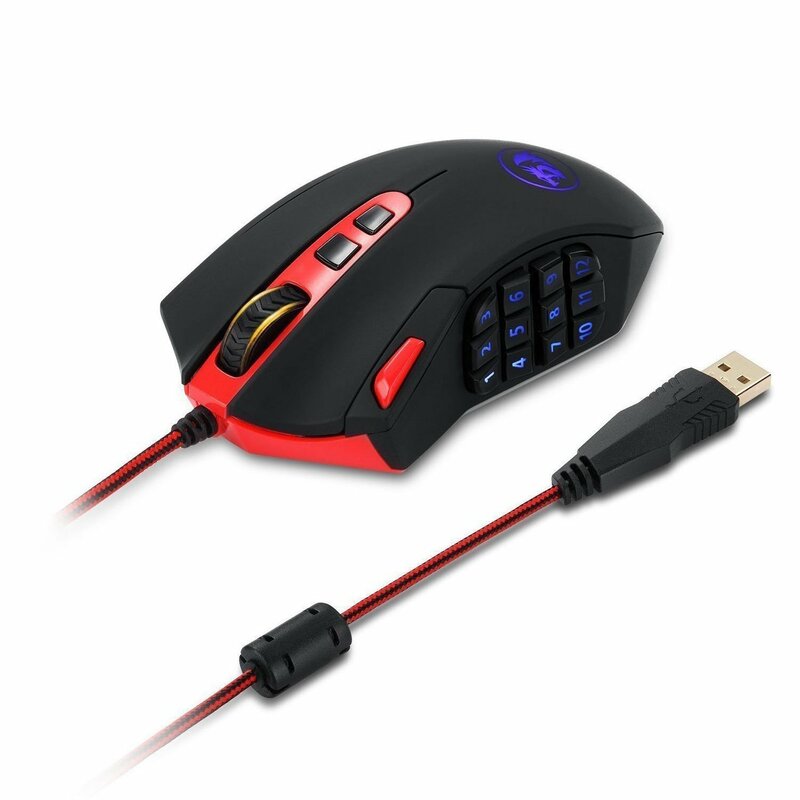 All in all, this is the mouse to get if you’re a big time WoW fan because it not only comes with what is known as premium features for a lower price point but the software is also going to be extremely beneficial for your WoW efforts. So what do you guys like about this mouse? Is it the best gaming mouse for World of Warcraft? Tagged best gaming mouse, best mouse for world of warcraft, gaming mouse, mmo mouse, redragon perdition, world of warcraft. Bookmark the permalink. I haven’t tried playing the World of Warcraft yet and I suppose that I would not class myself as an avid game player, in general. However, I do like to pass the time playing games and this gaming mouse looks like an awesome must have tool. I have bookmarked this page and will keep it in mind if I decide to increase my gaming time. Plus it will make a wicked present. Indeed, this would be a great gift idea Lis! Great post, very informative. I wanted to buy one of these gaming mouse and I’m not even a gamer lol.